1. How many people arrived? 2. What’s the profession of the important middle-aged man? 3. What kind of roof does the county court-house in Constantinople have? 4. What is the relationship between the judge and Jeff Thatcher? 5. What do you think is the translation of ‘to show off’ in Spanish? Most of the whispering had been caused by an unusual event. Visitors had arrived, specifically Thatcher, the lawyer, who was with an old feeble man, a rather large and well-dressed middle-aged gentleman with iron-grey hair, and a dignified lady who was almost certainly the lawyer’s wife. The lady was holding a child’s hand. Tom had been restless and full of regret. He couldn’t look Amy Lawrence in the eye. He could not meet her loving gaze. But when he saw this small new-comer his soul was immediately on fire with happiness. The next moment he was "showing off" as much as he could. He punched other boys, pulled hair, made faces; in a word, using every art that seemed likely to fascinate a girl and win her applause. There was only one negative aspect to his good mood, and that was the memory of his humiliation in this angel's garden. But this memory, as if written in sand, was being washed away fast under the waves of happiness that were sweeping over it now. The visitors were given the highest seat of honor, and as soon as Mr. Walters' speech was finished, he introduced them to the school. The middle-aged man turned out to be a very important person, no less than the county judge, surely one of the most impressive people these children had ever looked at. They wondered what kind of material he was made of, and they half wanted to hear him roar, and were half afraid he might, too. He was from Constantinople, twelve miles away, so he had travelled and seen the world. These very eyes had looked upon the county court-house, which was said to have a tin roof. "Look at him, Jim! He's a going up there. Hey, look! He's a going to shake hands with him - he IS shaking hands with him! My God, don't you wish you were Jeff?" Mr. Walters started "showing off," with all sorts of official noises and activities, giving orders, delivering judgments, giving directions here, there, everywhere that he could find a target. The librarian also "showed off" by running here and there with his arms full of books and making the most of the fact that he had authority and a respected position. The young lady teachers also "showed off" by bending sweetly over pupils that had just been fighting and lifting pretty warning fingers at bad little boys and patting good ones lovingly. The young gentlemen teachers also "showed off" by telling off children and making other little displays of authority and fine attention to discipline. Most of the teachers, of both sexes, found something to do by the bookshelves next to the pulpit, and it was business that frequently had to be done over again two or three times. off" with such energy and dedication that the air was thick with bits of paper and the noise of playful pushes and hits. And above it all the great man sat and beamed a majestic judicial smile all around him, and warmed himself in the sun of his own grandeur. He was "showing off," too. 1. What were the colours of the different kinds of tickets that Tom had? 2. How did Tom get the tickets? 3. What do you think the expression ‘his tongue was tied’ means? 4. How many verses of the bible did they think Tom had learned? 5. What question did the judge ask Tom? There was only one thing that was missing in order to make Mr. Walters' ecstasy complete, and that was a chance to deliver a Bible-prize and find a prodigy for everyone to see. Several pupils had a few yellow tickets, but none had enough. He had been asking around among the star pupils. He would have given anything, now, to have that German boy back again with such a good brain. 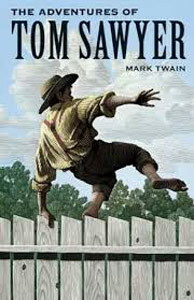 And now at this moment, just when hope was dead, Tom Sawyer came forward with nine yellow tickets, nine red tickets, and ten blue ones, and demanded a Bible. This was a thunderbolt out of a clear sky. Walters was not expecting an application from this boy for the next ten years. But there was no denying it, this boy had the tickets and they all looked valid. Tom was therefore elevated to a place with the Judge and the other places of honour, and the great news was announced. It was the most stunning surprise of the decade, and the feeling was so deep that it lifted Tom up to the judge’s altitude and hero status. Now, the school had two marvels to look up to in place of one. 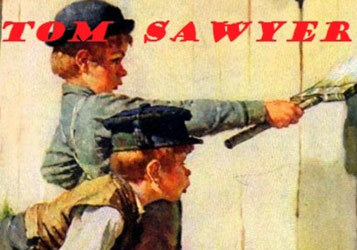 The boys were all eaten up with envy, but those that suffered the most were those who realized too late that they themselves had contributed to this by swapping tickets with Tom for the wealth he had obtained by selling the opportunity to paint the fence. These children despised themselves, as being the victims in a nasty trick. The prize was delivered to Tom with as much enthusiasm as the teacher could manage under the circumstances, but it lacked truthfulness. The poor man's instinct told him that there was a mystery here that could not be known. It was simply ridiculous that this boy had learned two thousand pages of biblical wisdom on his own. A dozen would be pushing things to the limit, without a doubt. Amy Lawrence was proud and happy, and she tried to make Tom see it in her face, but he wouldn't look. She wondered why, then, she was just a bit upset. Then a small suspicion came and went, then came again. She watched. A quick glance showed a lot and then her heart broke, and she was jealous, and angry, and the tears came and she hated everybody. Tom most of all (she thought). "Oh, no, not Tom, it is……"
"Ah, that's it. I thought there was more to it, maybe. That's very well. But you've another name I suppose, and you'll tell it to me, won't you?" "That's it! That's a good boy. Fine boy. Fine, manly little fellow. Two thousand verses is a great many, very, very great many. And you can never be sorry for the trouble you took to learn them because knowledge is worth more than anything there is in the world. It's what makes great men and good men. You'll be a great man and a good man yourself, some day, Thomas, and then you'll look back and say, It's all owing to the precious Sunday-school privileges of my boyhood. It's all owing to my dear teachers that taught me to learn. It's all owing to the good teacher, who encouraged me, and watched over me, and gave me a beautiful Bible, a splendid elegant Bible, to keep and have it all for my own, always. It's all owing to being brought up correctly! That is what you will say, Thomas, and you wouldn't take any money for those two thousand verses, no indeed you wouldn't. And now you wouldn't mind telling me and this lady some of the things you've learned, no, I know you wouldn't, because we are proud of little boys that learn. Now, no doubt you know the names of all the twelve disciples. Won't you tell us the names of the first two that were appointed?" "Answer the gentleman, Thomas. Don't be afraid." "Now I know you'll tell me," said the lady. "The names of the first two disciples were……"